Create your own custom keychains with the help of these design templates. Sticky Life brand keychain templates are fully customizeable and will allow you to change the text, colors and images. You can also upload your own pictures, logos and more through our design tool. It is our suggestion to keep your design simple. Because the tags are only 1"x2" in size it does not leave much room for a lot of detail. Our keychains are manufactured from a powder-coated steel blank. We apply your design through a printing process called sublimation. This printing process allows us to achieve photo quality results. We do not stamp, press or emboss our key tags. The results feature a high gloss finish. All orders come with a large and small ring for your keys. During the Digital Proof phase you will have an option to remove the ring from your order, if desired. 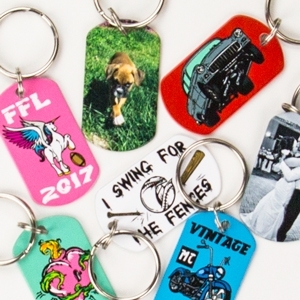 Many of our keychain customers order our custom printed key rings as a gift for the new driver in the family. We have sold many of our keychains that were used as a memorial for a lost loved one. Other uses are for product swag with company logos. If you already have a design idea in mind you may want to consider using our start from scratch keychains.